Find museums, palaces, art, shops and even a beach in the heart of Europe, making Vienna a perfect destination for family travelers. Vienna, Austria’s capitol city, is a bustling urban metropolis that entices visitors with its picturesque blend of the old and new. Families can explore the historic city center that was named a UNESCO World Heritage Site in 2001, get their thrills at one of Vienna’s newest amusement parks, or take a leisurely stroll through gardens, palaces or along the Danube River. Travelers should know that the city is called Wein (pronounced “Veen”) in the country’s native tongue of German, but the friendly and helpful locals all speak some English and warmly welcome visitors from around the world. Searching for historical facades or those narrow streets and alleyways? Vienna, like most major European cities, has had its share of a modern makeover, but there is still a large section of the city center that maintains an “Old City” look. The historic buildings meet the modern architecture, literally, at the Gothic arches and mosaic roof of St. Stephens Cathedral directly across from Hass House, a postmodern building with a glass facade. At the center of Vienna is Stephansplatz, the square where you will find street performers with instruments or even puppets, along with a few live statues and at least one man dressed as Mozart. Be sure to stop in for something sweet at the nearby Manner Shop, featuring the popular “Manner enraptures,” which is like a wafer bar, but with a hazelnut filling. The sweet shop’s peach and blue labels are seen throughout Austria. Around Stephansplatz, alleys are filled with fashion boutiques and jewelers, along with cafes and restaurants that crowd the street with outdoor tables and chairs, perfect for taking a break to people watch, address postcards, or simply relax with a cup of coffee and a little pastry or two. Since this is a pedestrian side of town, there aren’t any cabs or trolleys, but visitors do have the option of taking a fiacre, or a traditional horse drawn carriage, through the Old City. Not far from the Old City is Danube Island, a city dweller’s close escape to grassy parks and sandy beaches. Now split by the Danube Canal, there are two parts of the island. The “Small Danube” is a location for summer music festivals, along the outskirts of the Old City area. The “Old Danube” remains a little more serene and is still a haven for nature lovers. There are several trails for skaters and cyclists and plenty of playgrounds. For those who aren’t afraid of heights, the Danube Tower offers guests amazing views from 500 feet up. Danube Island can be reached from the U1 metro stop, “Donauinsel” or by the DDSG Blue Danube Shipping riverboats. Call ahead of time to arrange private tour cruises that specialize in Pirate treasure hunts and children’s riddles en-route to Danube Island. After the popularity of Sophia Coppola’s “Marie Antoinette” film, many of the guests at Schönbrunn Palace are interested in visiting the birthplace of the famous (or infamous) Queen. Dating back to the Middle Ages, the palace was later built to compete with the palace at Versailles. Since the end of the monarchy, Schönbrunn Palace has been open to the public and even today the locals take advantage of these lovely gardens as a place to relax or exercise, so watch out for runners! Check ahead of time to see if there are special exhibits or events at the Palace, there are frequently concerts throughout the summer. The palace itself is worth touring, especially with the free headset given to all ticketed guests. Different versions of admission are available, but for the most part the shorter tour through the rooms includes the most important parts, such as the Mirror Room, where a 6-year-old Mozart performed for Empress Maria Teresa. Although the audio guide was successful in describing the general layout and explaining the purpose of each room in respect to its decoration, the guided tours volunteer much more information. For example, the audio guide omits the fact that although Maria Teresa married for love, she forced most of her children into arranged marriages to further Austria’s international relations, giving her the epithet, “Mother-in-Law of Europe.” The guides also share gossip, such as which siblings were favored by their parents most and who was envious of those relationships. The neatly manicured hedges and rose bushes provide a tranquil atmosphere for all ages. Benches are placed throughout the grounds near the back of the palace and throughout the paths up Schönbrunn Hill. Of the several fountains, the Neptune Fountain at the bottom of Schönbrunn Hill is probably the most impressive, but throughout the side paths there are numerous hidden ones. That marks the beginning of Schönbrunn Hill, which can be reached by the zigzag path up to the Gloriette, another impressive structure that, from the top, offers spectacular views of Vienna. On the right side of the park grounds there are several children’s attractions, like a hedge maze which might prove somewhat easy for older kids. The original designs for the maze were created at the end of the 17th century and plants are now maintained to resemble the same plans. Near the hedges is a labrynth with mirrors recreating a giant kaleidoscope. Nearby is the Schonbrunn Zoo; the world’s oldest zoo, it is home to rhinos, pandas, penguins and polar bears. If the weather turns to rain, the zoo is the perfect attraction, since many of its habitats can be viewed indoors. More than 120 museums can be found in Vienna, making this city an art connoisseur’s fantasy come true. The MuseumQuartier, one the 10 largest cultural complexes in the entire world, is the best place within the city center to begin a refined (and family-friendly) museum experience. Located among the former imperial stables, the biggest modern structures of the MuseumQuartier are the Museum of Modern Art (MUMOK) and the Leopold Museum. MUMOK is probably best for a family to visit on a Sunday between 2 and 6pm when the museum offers painting workshops for kids between the ages of 6 and 12. Parents are usually asked to join in the fun as well, so be prepared to let your creative genius flourish. The Leopold Museum, which features a vast collection of works from Egon Schiele, is not as child-friendly unless your children are interested in the masterpieces of the Austrian Modernist Movement (which they probably are not). The best museum for kids in the MuseumQuartier is the ZOOM Kinder Museum . Encouraging children to use their hands, hearts and mind, ZOOM fosters the feeling that learning should not only be interactive, but fun as well. The Interactive Exhibition allows kids ages 6-12 to find their own answers to puzzles in science, art and culture, while the ZOOM Studio offers workshops that give the young ones a chance to work on their art portfolio with paint, glue, felt and other materials. ZOOM also have a multimedia lab for older kids and an Ocean area for the tiny crowd. Whether exploring one or all of the ZOOM areas, each child learns or “zooms” in on an idea or object in a different and unique way. ZOOM also features various traveling exhibitions, such as the history of the ball and how it relates to sports, which is currently on display. Upon visiting all of your museums, pay attention to the backdrop of the MuseumQuartier, which consists of charming cafes, bars, restaurants and art stores. A leisurely stroll around the area can make for a perfect mid-afternoon pit stop or a lunch break. Make sure to stop by the wienXtra Children’s Info Center to gather more information about fun and exciting attractions in Vienna for the 13 and under crowd. All assistance is free of charge and the staff is more than happy to provide a family with a list of kid-friendly events (everything from theater performances, music schools and American football games) going on in city during your stay. Other fun museums that may appeal to a child’s interest include the House of Music where kids can learn about Mozart and instruments while they mix their own CD and virtually conduct the Vienna Philharmonic. Also great for the young ones is the children’s program at the Austrian Museum of Applied Arts. If that does not spark your kid’s desire, call it, as locals do: the MINI MAK. On the third Sunday of every month at 11am, the MAK offers children 4-years and older original tours of the museum, but with a kid’s approach. Think puzzles, games, workshops and other innovative and entertaining ways to experience the MAK’s brilliant collections. If MINI MAK is not offered while you are in town, inquire about MAK at Night and MAK4FAMILY, two other programs that bring the museum experience alive. Traditionally, Vienna is one of the global capitals of the “Ball.” But, with fancy gowns, full orchestras and formal dancing, this may not be the best idea for kids. But nowhere does it say that you must attend one of these extravagant (and slightly old-fashioned) events in order to have a ball. Instead, families can explore some of Vienna’s less formal yet traditional settings. 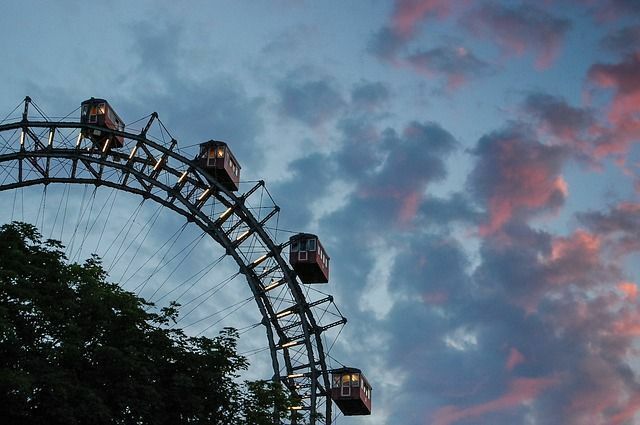 At the Vienna Prater, the home to over 250 attractions and rides, is one of the world’s largest and oldest Ferris Wheels, the Risenrad. It is 210-feet-tall and was built in 1897! The amusement park is situated on an old imperial hunting ground comprising over 1,500 acres of woodland in the heart of Vienna. The Haunted Hall and ghost trains can be a little spooky for the younger kids, but teens in the mood for a scare will love them, and right across is a terrific beer garden, the “Schweizerhaus.” Prater Park is open daily from 10am- midnight (weather permitting) from mid-March until the end of October. If Vienna seems a little too big for your child to handle, take a break from the life-size attractions to explore Minopolis, a 65,000-square-foot, child-size theme park. Youths ages 4- to 12-years can become a citizen of Minopolis the moment they arrive at the park. With special Minopolis currency, children can play adults in their dream job of a doctor, teacher, journalist, photographer or fireman. The park is divided into 25 areas and there are over 80 different professions to experience through role-playing games. Who knows, your child may even find his or her life’s calling by the time you leave. There are many hotels in Vienna, as well as inns and Airbnb, and we found two very special ones on a recent visit: Best Western Premier Hotel Harmonie and the Austria Trend Parkhotel Schonbrunn. This video gives you a sense of how they differ and which might be the best choice for your family, as almost any neighborhood is a good one to be in. The best way to travel around Vienna is most certainly by public transportation. The Vienna Lines, as they are called, consist of bus, subway and tram service (and Vienna’s tram system is the third largest in the world!) The biggest bonus that comes along with commuting this way is that children 6-years and under always ride free (valid ID or passport is required). Children up to 15-years-old ride free on Sundays and public holidays. But if these times do not fit your schedule, keep in mind that during all other times, the older kiddies can get half-price tickets when purchased ahead of time. Or, families can opt to purchase a Vienna Card. The card enables its holder to have unlimited access to all public transportation throughout the city for a 72-hour time period. Available through the Vienna Tourism Office and at most hotels in the city, the card also offers discounts to more than 210 different museums, restaurants and attractions throughout Vienna. For more information about the Vienna Card or family-friendly hotels and deals, visit Vienna’s Board of Tourism website.